In early 2015, the leaders at East Side Grace Brethren Church in Blacklick, Ohio, started talking about practical ways to turn the focus of their church outward through various ministries. They dubbed this new initiative #EastSideOutside. “Some of [the ministries] were familiar: intentional nursing home visits, and home bound people, yard work for families, that sort of thing,” says Chip Heim, pastor at East Side. 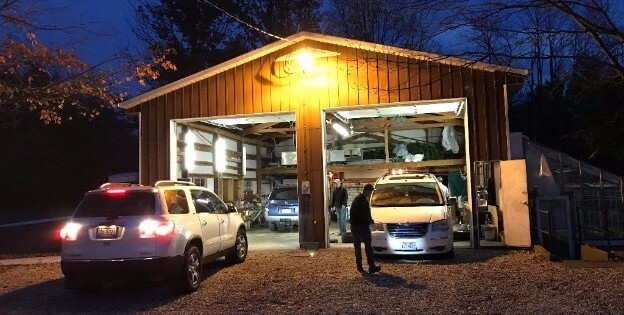 Then the adult ministry pastor at East Side, John Harmony, presented a unique idea: offer car care available at no charge one night a week during the fall and spring seasons, offering services such as oil changes and repair jobs, along with a cookout while the community members waited for the repairs. All of this would be offered for free. So, they set a date and time. For eight weeks after Labor Day, Wednesdays from 6-8:30 p.m. would be open for the community to bring their cars for repair. They put up signs, raised money, garnered volunteers… and waited. Heim expected one or two cars that first night, and was surprised when instead almost a dozen families showed up. And they kept coming. They made the event accessible to whole families with a bounce house, sidewalk chalk for kids, tables where people could eat outside as they waited for their repairs, and a car wash run by youth group members and elders alike. The resulting event garnered church-wide volunteers and had the air of a festival. “People are sitting down eating together with others that they don’t know, and everybody leaves satisfied,” notes Heim. And he could tell that it was meeting a real need in the community as well. The church closed up their third season of the outreach having repaired a total of over 300 cars – far more than Heim ever expected. 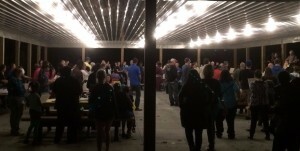 The last event was November 2, (pictured at right) when the church put on a special rib dinner to celebrate a successful season with the community. Another session will open up in the spring. Send Pastor Heim a note of encouragement and find out how you can pray for the ministry by emailing him here. Feature photo: At Eastside Grace Brethren Church, community members can get their cars fixed for free during an event put on by the church called #Eastsideoutside.